For the first exhibition of 2019 we hosted Rory ‘The Dam Builder’ Prout, with his fine array of amazingly subtle paintings inspired by his cycles around the countryside, and titled via Flan O’Brien’s The Third Policeman. 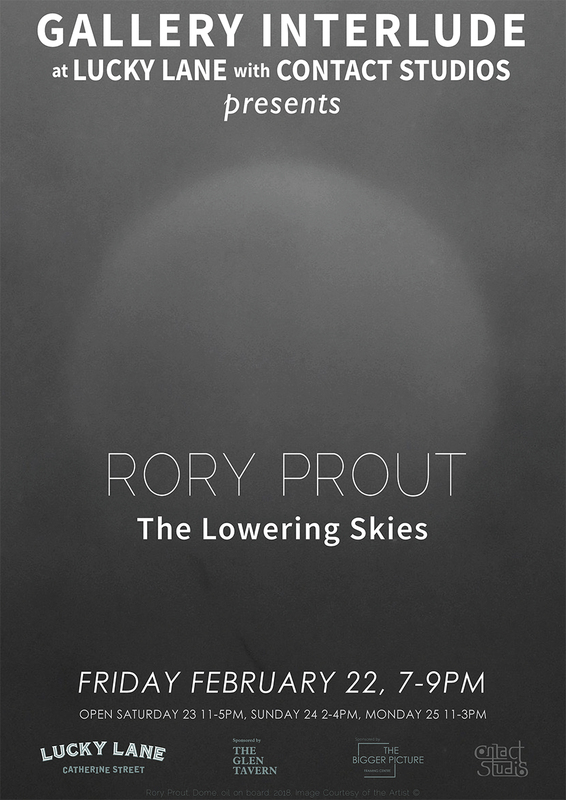 It was a night of firsts for us at ‘Interlude – our first show of 2019, the first time we had an artist travel from abroad (via Eastborne in England), and indeed, Rory’s first solo show in Ireland. There was a fantastic turn out, and indeed a few familiar faces from the past turned up from as far away as Tipperary, Kilkenny and Dublin. 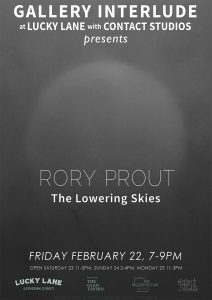 We sincerely hope to see more of Rory, and his excellent work in the future, and as part of our manifesto, we will continue to show the best of art, and campaign for venues and avenues to show it in Limerick City into 2019. 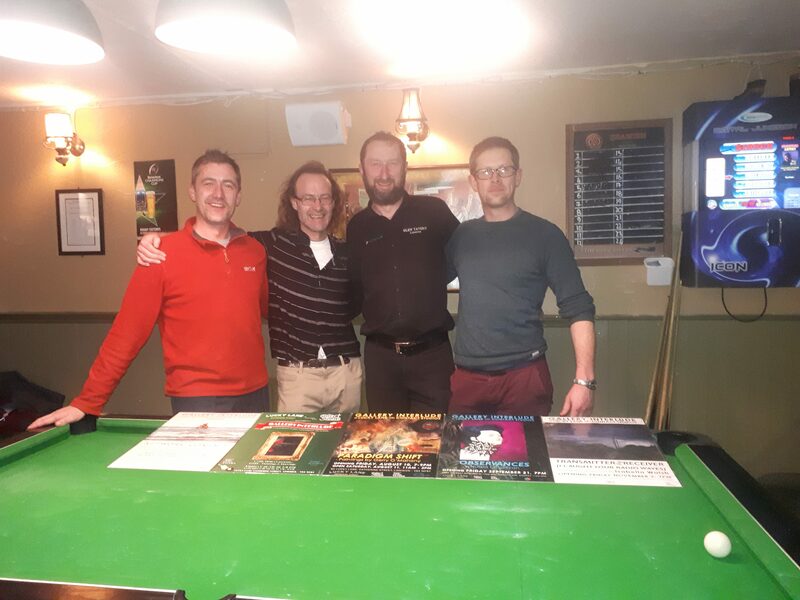 As always, a million thanks to Mark, Dave, Steve and Noah of Lucky Lane, and our supporters The Bigger Picture Framing Centre and The Glen Tavern. 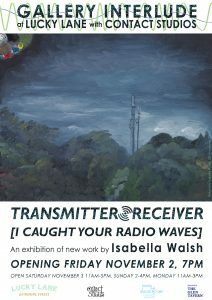 Go raibh míle maith agaibh ar son mise, Isabella Walsh agus Ciaran Nash (Foireann Gallery Interlude). Steve (Lucky Lane), Artist Rory Prout, Carl and Mark (Lucky Lane). It’s one of the privileges of having a hand in running a gallery that you get to facilitate, see and promote the work of artists you admire and would like to see represented more widely. 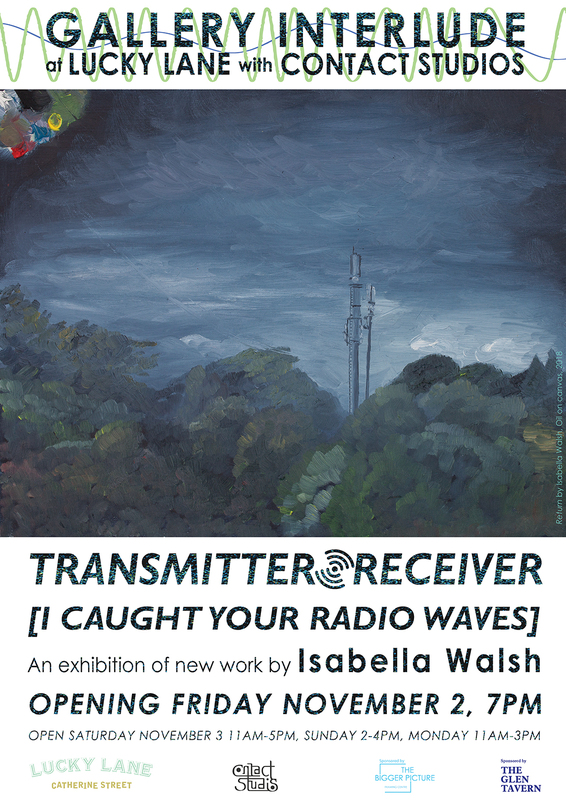 Friday November 2nd is another such occasion, when we unveil Isabella Walsh’s multi – disciplinary show, Transmitter/Receiver [I caught your radio waves]. Isabella has been an integral part of Contact Studios since she joined a number of years ago, while also being a key member of the Gallery Interlude project for which I’m very grateful, and is an all round superstar. The show is choc full of several different drawing approaches – pen and ink, multi media and paintings, all revolving around the Castleconnell, Co. Limerick landscape, which has been her home for many years. Having seen the layout for the show I’m fierce excited to see how it works in the ‘Interlude space, and indeed, I think the audience reaction will be great! As always, a sincere thank you to Mark and Dave of Lucky Lane, Isabella, Ciaran Nash for the (super) poster design, Kevin O’Keefe of The Bigger Picture Framing Centre, and The Glen Tavern, where we will attend after. Below is a snippet from ‘Bella’s statement, and do come along should ye be about! ‘This body of work is about relationships -physical, emotional and temporal. It began with my consideration of my relationship to this landscape, a place I have known my whole life and will soon be leaving. Since April 2018 this pair of towers, their relationship to each other and to the landscape surrounding, became the focus of my observation on daily walks in the area. In particular how they appear to change depending on my perspective. These changes are documented through plein air painting, drawing and photography. Through this sustained process of observation I have contemplated all of my close relationships: with other people; myself; and this place’, Isabella Walsh. 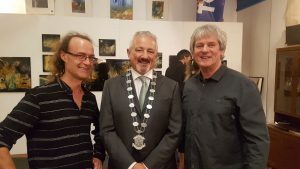 It was a case of a great day had by all last October 12th, with the official unveiling of the 2017 and 2018 additions to the National Self Portrait Collection, at the Bourn Vincent Gallery in the University Of Limerick. 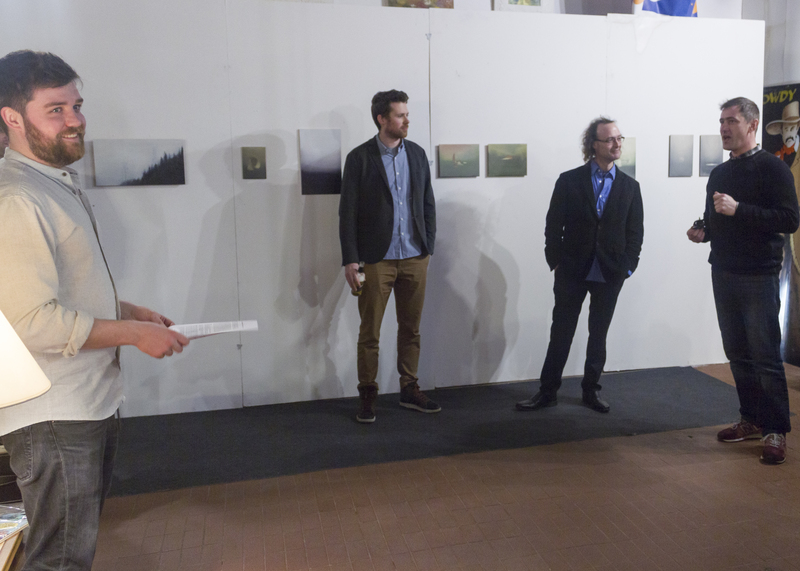 The great and the good, and 14 of 20 artists attended, and were fed and watered while receiving insights from the podium into each work. Many well wishers attended (including my parents), and I must express my gratitude to all who made the effort to attend, and the kind words. My especial thanks to Yvonne Davis of the Bourn Vincent for all her work and assistance, and indeed, to the board members for inviting me to participate. As always, my thanks to Declan Greene – unsurpassed Fine Art Photographer, and fine Painter – for the great documentation of the work. 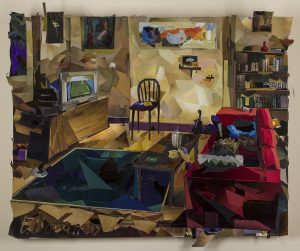 ‘At Home…’ portrays a typical evening at my house in New Road, where I have lived for over ten years. 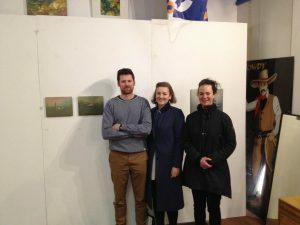 As an artist I tend to collect other artworks from artists I respect and admire, and some of these are referenced in the work – (l-r) Kevin O’ Keefe Daffodil Study, Michael Delohery Refusal to Play, Broken Dreams (by myself), two pieces by Laura McMorrow, Ciarán O’Sullivan Apprehension, and a ceramic vase by Clare Butler. My own two illustrated books are also referenced laying on a chair – Mathilda & the Belligerent Blackbird (yellow cover), and Skippy’s Tale (purple cover). my parents bought me as a gift from Italy, and a humorous ashtray my Mother brought back for me from Las Vegas which reads Carl’s Butts. Also pictured are two musical instruments, a ukulele and a shaker (on the armrest) referencing my time playing music with Luggage Doors Operating. The piece is made entirely of collage, small pieces of magazines cut up to create a painting type effect – a process/technique I call Aesthetic Collage. Had a ball lending my vocal ‘talents’ to Latitudes’ Max and Mariana for their sound project for Askeaton Contemporary Arts (ACA) 2018. Sometimes it’s best to leave the synopsis making to the experts, so the following text is directly from ACA. The link below will lead directly to the 12 minute or so tale – do enjoy, it’s a real swashbuckling adventure!!! “The Pilgrim” by Tim Kelly. Read by Carl Doran. Published in Askeaton-Balysteen Community News, Summer 1984. This is a story of young love, of a clandestine marriage of a jealous father. It is the tale which involves an Italian, and a Spaniard, and a morbid blood-hunt that links Barcelona with Askeaton. And of murder – of cruel, bloody murder. 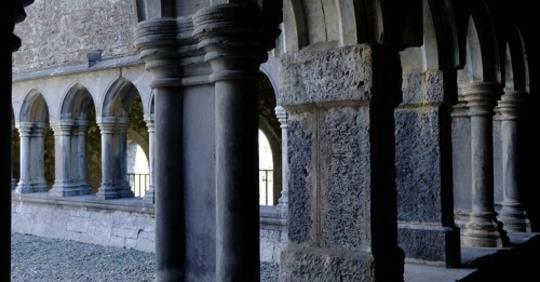 The dramatic narrative brings to life a cryptic inscription in the cloister of Askeaton’s Friary that reads “Beneath lies the Pilgrim’s body, who died January 17, 1784”. “The Pilgrim” was Latitudes’ contribution to the Askeaton Contemporary Arts 2018 residency “Welcome to the Neighbourhood”. It is a starting point rather than a conclusion. A textual splinter that is now pointing us towards future research around the navigators, pirates, traders, religions, and economies which linked Ireland with the Atlantic and western-Mediterranean sea-lanes during the last centuries. 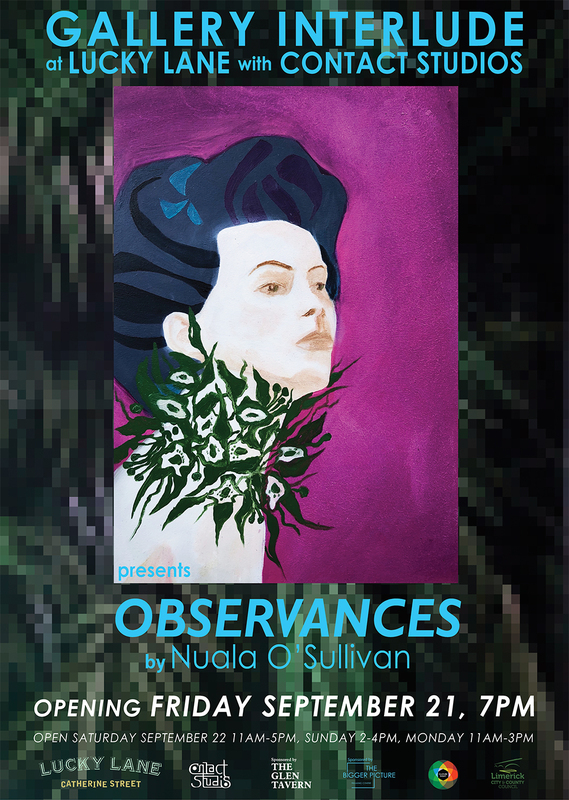 Observances by Nuala O’Sullivan at Gallery Interlude, September 21 2018, 7-9pm. 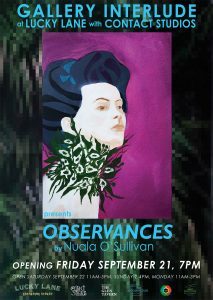 As part of my own, and Contact Studios’ mission to highlight the lack of Cultural spaces and resources in Limerick, and to bring the best of Limerick based artists to the public, we will present Nuala O’Sullivan’s exquisite suite of paintings in our popup gallery in Lucky Lane, Catherine St. this Friday. It’s an absolute pleasure to bring these works to the public’s attention, and to hopefully bring greater recognition to a Contact stalwart, who has given so freely of her time to promote and maintain the cause of local artists, and indeed the mental health services through our previous work with Art-in-Mind, and latterly Le Chéile. Personally, I have mixed feelings around the concept of Culture Night. On one hand it is a great opportunity for the public to see the arts, but on the other it gives a false impression that the Arts are thriving, and reinforces the idea that cultural practitioners can survive on publicity alone! Expect some musings on this topic on the night. Also a special shout-out to Mark and Dave (and Steve!) from Lucky Lane without which we couldn’t do this project, and our sponsors Kevin O’Keefe of The Bigger Picture Framing Centre, and of course Ger Callinan and the team from The Glen Tavern. Pictured above are (l-r) myself, Deputy Mayor for Limerick Jerry O’Dea, and artist Gerry O’Mahony at his opening in Gallery Interlude. We had a great launch for our second show, and delighted that Jerry, a councilor who has been extremely supportive of our group could come along. We also appreciated his vocal support for Limerick becoming a real city of culture in practice, from the ground up – go raibh míle maith agat! 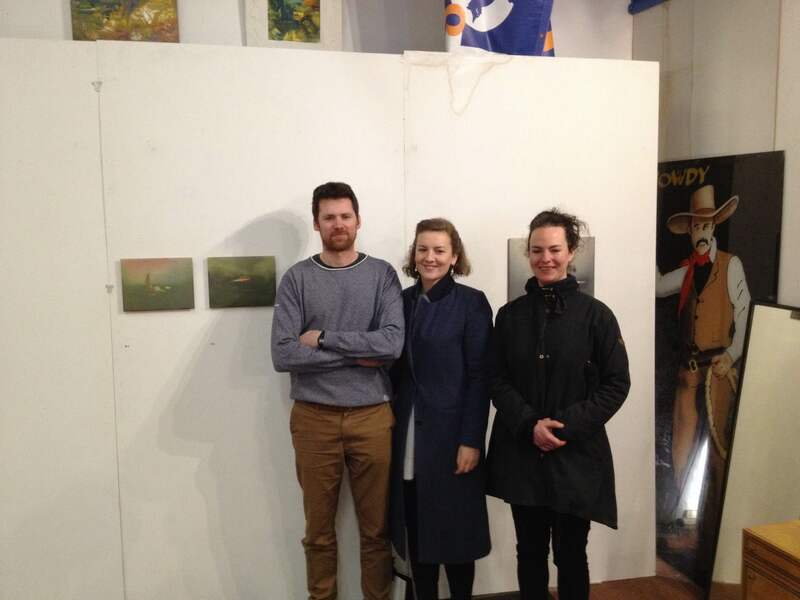 It’s a great privilege for myself and the Gallery Interlude team, to play host to Gerry O’Mahony. 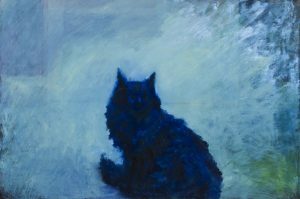 His work is at once recognisable for its over-layering, deft application of paint and oil pastel/bars, and glass-like surface. Expect a great crowd, a great show, and some great craic, followed by a few bevvies in The Glen Tavern, one of our sponsors. Our thanks also to Kevin O’Keefe of The Bigger Picture Framing Centre for his continued support! 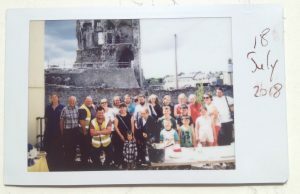 I was honoured and excited to be part of the Welcome to the Neighborhood program of events, the 13th iteration of the Askeaton Contemporary Arts (ACA) Festival as curated by Michele Horrigan. In association with ACA and working closely with the Office of Public Works (OPW), I have commenced a project entitled ‘The Stonebreakers’ exploring the day-to-day activities of the OPW workers on the site of Desmond Castle in Askeaton town. The project will see me embedded on various days over the course of perhaps 9-12 months on site, documenting the various activities undertaken through drawing. Similar to my War Journal Project (see projects section of my website), my aim will be to push my drawing skills to capture an alternative take, and to more clearly understand how the Castle and OPW ecology works. I intend to produce a publication, more than likely a comic to educate the public young to old on what goes on in stabilising and re-imagining the castle’s structure, and perhaps some larger illustrated panels referring to tools of the trade. We will also host another couple of informal public progress reports and information events over the lifetime of the project. What are They Building Over There?, the title of the ACA event served as an information lunch for the general public, and my thanks to all who attended and made it happen. 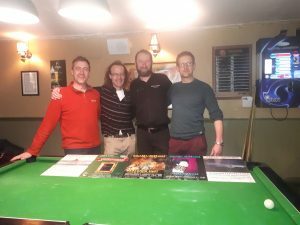 Especial thanks to Joe & Edward (OPW), masons who gave a very informative talk and questions and answer session, and to Billy Foley (OPW) for his support, and as always my thanks to ACA, and The Arts Council. Further progress will be reported here in the future! Excitement is building around the city and the studio as we prepare to launch Gallery Interlude. 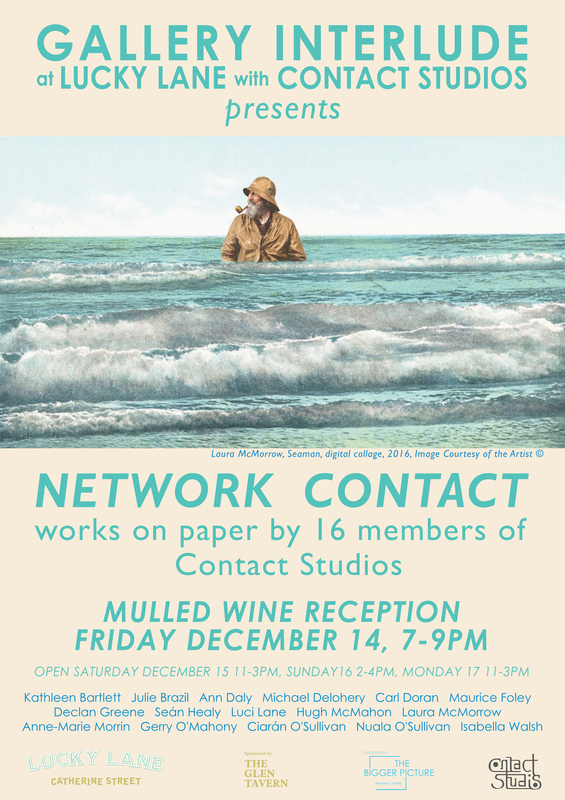 A partnership between Contact Studios and Lucky Lane, with the aim to provide a venue to exhibit works by Contact Studios members, and to draw attention to the lack of exhibition opportunities and cultural resources, we will operate at 6 week intervals. The first show is scheduled for 7-9pm, Friday June 22, and will be on view the following day also between 11am and 3pm. Simply entitled ‘Cats’, I will present a solo exhibit consisting of 6 oil paintings, and 3 charcoal drawings, studies of my feline friends Squealer (pictured), Mindy & Mandy. The majority have been completed in the last few months, during my time in Wickham St. Studios, and have a playful, direct style, which I hope will be enjoyed by the public. 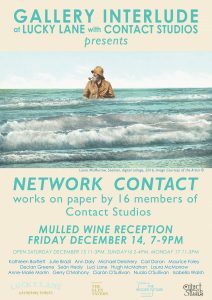 It’s my first solo painting show in over 3 years, so there is some trepidation on my part, but sure that’s only normal. A big shout out to Mark and Dave of Lucky Lane with whom I’ll collaborate. Their indoor market captures the essence of Old Limerick, and they, like myself are very keen on the idea of making the city viable as a living entity, and as a location that embraces and fosters the Arts. A big shout out also to our other partners, The Bigger Picture Framing Centre, and the Glen Tavern, local businesses who will provide additional help and support to the project. I’ll follow this post with an update on how things went, but do come along! !